So before you put your house on the market, peruse this checklist of things you must do in preparation. Some of these tips are surprisingly easy, while others might require a bit more elbow grease. But they're bound to pay off once buyers start oohing and ahhing over your place—and hopefully ponying up a great offer. Think you can sell your home yourself, and pocket the cash you would otherwise pay an agent? It can be tempting, especially in a hot market, but resist the urge, says Jon Sterling, a real estate consultant with Keller Williams Realty in San Francisco. He’s found that a "For Sale by Owner" transaction is almost always a disaster, leading you to sacrifice both money and time. That said, don’t just blindly hire the agent who most recently sent you a flier or the one your uncle’s friend's co-worker's cousin used. Do some research to find a real estate agent (or ideally a few) who is knowledgeable about your specific market, and then interview her to make sure she's a good fit. Make sure the first thing prospective buyers see of your home entices them to want to see more. Yes, for better or worse, buyers do tend to judge a book by its cover. By investing some effort in relatively easy fixeslike planting colorful flowers and repainting your front door, the outside of your house can beckon them to come on in. Less is definitely more when it comes to getting your house ready to show, notes Boris Sharapan Fabrikant, a real estate broker with Triplemint. Do a clean sweep of counters, windowsills, tables, and all other visible areas, and then tackle behind closed doors: closets, drawers, and cupboards—since virtually nothing is off-limits for curious buyers. And if the house is overflowing with stuff, they might worry that the house won’t have ample space for their own belongings. Take the excess and donate or pack it up for a storage space. The bonus to taking care of this now is that it’s one less chore you’ll have to do when it’s actually time to move. The next step on your declutter list? You want to remove any distractionsso the buyers can visualize themselves and their family living in the property, says Kipton Cronkite, a real estate agent with Douglas Elliman in New York. He says that includes personal items and family photos, as well as bold artwork and furniture that might make your home less appealing to the general public. The goal is to create a blank canvas on which house hunters can project their own visions of living there, and loving it. You might love that orange accent wall, but if it’s your potential buyer’s least favorite color, that could be a turnoff, warns Sharapan Fabrikant. “You’re pretty safe with a neutral color because it's rare that someone hates it, but the other benefit is that a light color allows [buyers] to envision what the walls would look like with the color of their choice,” he points out. Even if you’re not doing a full-on repainting project, pay special attention to scrubbing and then touching up baseboards, walls, and doors to make the house sparkle and look cared-for. A small thing, sure, but you’d be surprised by the negative effect a loose handle or missing lightbulb can have on a buyer, notes Sharapan Fabrikant. “It can make them stop and think, ‘What else is broken here?’"
Green is good, because plants create a more welcoming environment. You might also want to consider a bouquet of flowers or bowl of fruit on the kitchen counter or dining table. Foul odors, even slight ones, can be a deal breaker, and the problem is that you might not even notice them, says Sharapan Fabrikant. He recommends inviting an unbiased third party in to try to detect any pet smells or lingering odors from your kitchen. If the smells are pervasive, you might need to do some deep cleaning, because many buyers are on to your “masking techniques” such as candles or plug-in room deodorizers. And then clean some more. 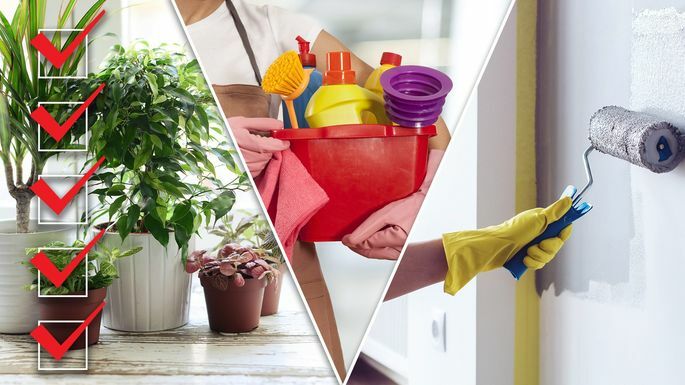 You want your property to look spotless. Take special care with the bathroom, making sure the tile, counters, shower, and floors shine. From art to jewelry, make sure that your treasures are out of sight, either locked up or stored offsite, recommends Kronkite. Does your house scream 1985? Nothing invigorates a house like some new furnishings or even just a perfectly chosen mirror. The key is getting your home staged by a professional. Home stagers will evaluate the current condition and belongings in your house and determine what elements might raise the bar. They might recommend you buy or rent some items, or they might just reorganize your knickknacks and bookshelves in a whole new (that is, better) way.